Today the last five categories were in action in Morocco for the Agadir Grand Prix 2018 edition, day 3. Discover below all the results of each category and follow us on social media. Stay tuned to discover more about that third and final day of competition and to read our analysis of the day. 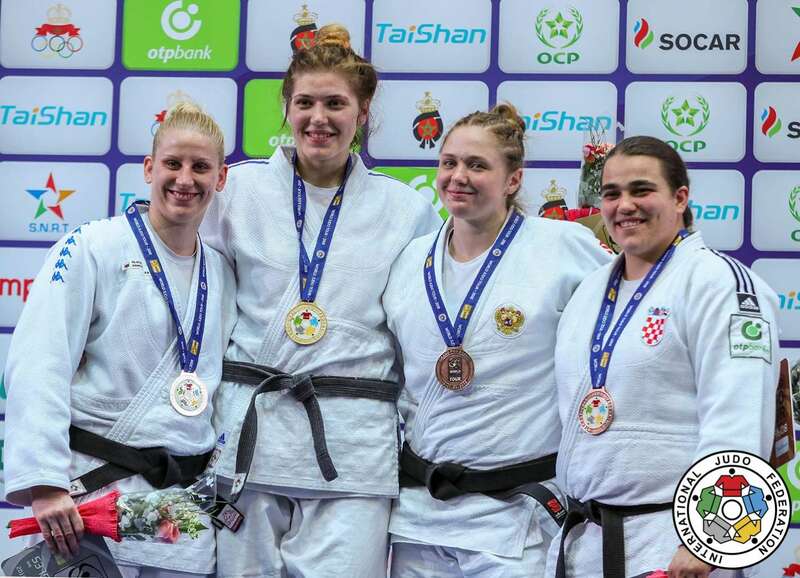 -78kg: ZIECH Signs her first GP Gold medal for Germany The first final of the women's division opposed the German Maike ZIECH, who had never won a medal on the World Judo Tour, and the winner of the Tashkent Grand Prix last year, Anastasiya TURCHYN (UKR). The German was the first in action. One head shorter than her tall opponent, ZIECH was not afraid of entering into the melee with TURCHYN, who in the last minute was penalised with a first shido. As nothing was scored, it was time for the golden score and ZIECH's attacks became more and more powerful, so TURCHYN was penalised a second time. 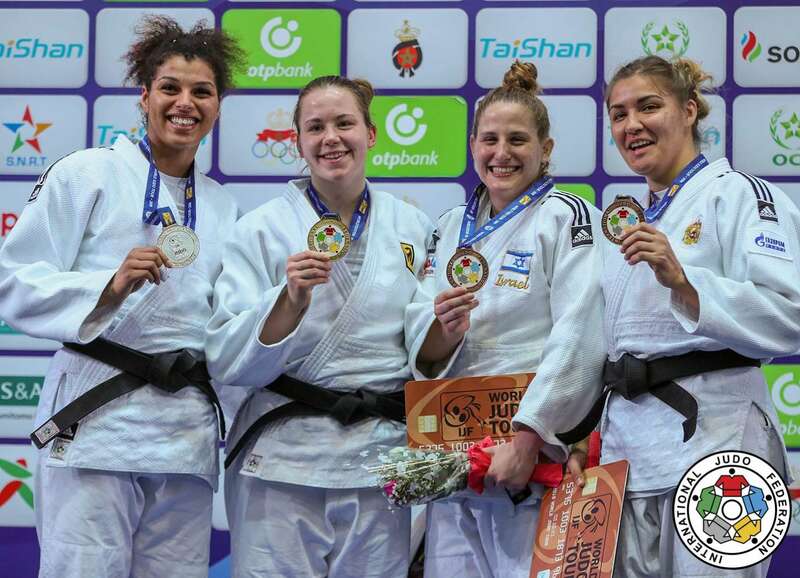 One minute and thirty six seconds into the Golden score, the German received a first shido but she kept attacking and attacking again, forcing TURCHYN to be penalised a third time, to win her first Grand Prix gold medal. In the first bronze medal contest, the 23 year old French woman, Julie PIERRET, faced Yarden MAYERSOHN of Israel, who already had two medals in a Grand Prix, as she was second in Antalya 2017, and third in Tashkent also in 2017. After one minute and forty seconds, both athletes were penalised with a first shido as they stepped outside of the competition area. 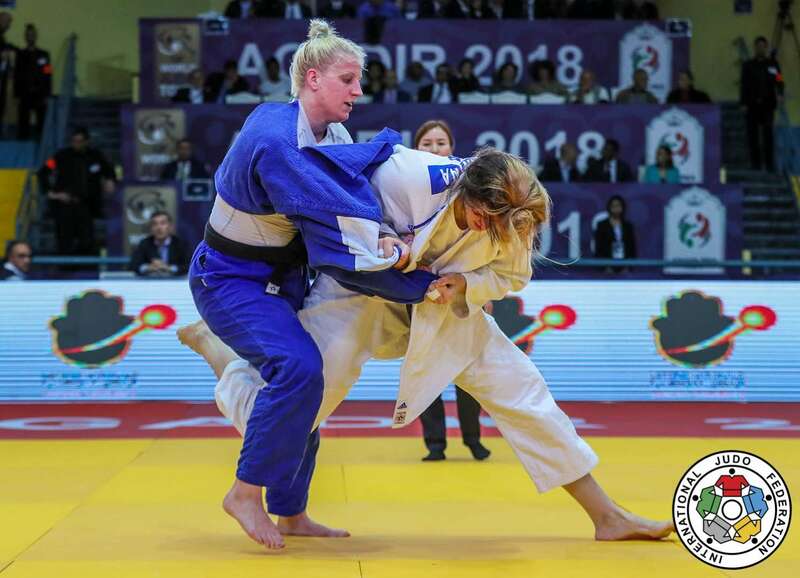 As the French tried to launch a sumi-gaeshi technique, Yarden MAYERSOHN anticipated the move of her opponent to control her on the floor and score a ippon with an immobilisation to win the third Grand Prix medal of her career. In the last bronze medal contest of the category, the second French, Vanessa DUREAU, was qualified against the top seeded athlete of the day, Anastasiya DMITRIEVA (RUS), who was defeated in the semifinal by Maike ZIECH. After one minute, DUREAU and DMITRIEVA were penalised with a shido for passivity. The Russian was rapidly penalised a second time as the French seemed to impose her grip, but despite that advantage, DUREAU was also penalised a second time as she was having both hands on the same side. In the golden score, DMITRIEVA was finally awarded the win as DUREAU was penalised for stepping out of the competition area. This is the medal number 9 for Anastasiya DMITRIEVA in a Grand Prix. +78kg: Great Conclusion for KALANINA in Agadir To conclude the women's tournament here in Agadir, the final opposed World number 15, Yelyzaveta KALANINA (UKR) and the Rio 2016 bronze medallist, Anamari VELENSEK (SLO). KALANINA was the first in action trying to take advantage of the fact that she is probably one of the tallest athletes on the circuit and that is what she did as she pushed Anamari VELENSEK to be penalised twice for passivity within the regular time. As the golden score started, everything was stil possible, but you don't change a tactic that works, and Yelyzaveta KALANINA continued to attack before her opponent. Even if the movements where not strong enough to score, they were powerful enough to make the Slovenian penalised a third time for passivity. This is the first gold medal in a Grand Prix for KALANINA. The first bronze medal contest opposed two young athletes as the local Yousra AOURZ (MAR), whose best result so far was a silver medal at the Cadet African Championship 2016, faced Anna GUSHCHINA of Russia, who was silver medallist of the Junior European Championships last year. A little more than 30 seconds were enough for GUSHCHINA to execute a perfect left handed uchi-mata for ippon. The shortest contact of the day so far. In the second bronze medal contest, Croatia secured a medal as both Ivana MARANIC and Ivana SUTALO of Croatia qualified to have a chance to step on the podium. A first shido was awarded to MARANIC for passivity, followed by the same penalty to SUTALO and half way to the end, both athletes were already penalised with one shido each. 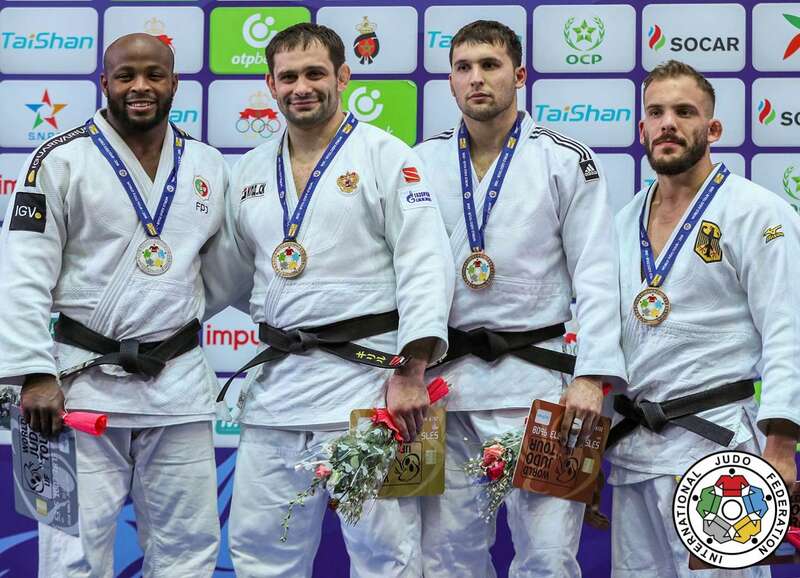 But as the athletes entered the second half of the contest, SUTALO scored a waza-ari which was immediately followed with an immobilisation for ippon to win here third Grand Prix medal. Men -90kg: One KHALMURZAEV can hide another one After the defeat of the current Olympic Champion, Khasan KHALMURZAEV, yesterday in -81kg, the hecatomb continued for international title holders as current world champion, Nemanja MAJDOV of Serbia, was defeated in the semifinal by Ciril GROSSKLAUS (SUI). In the final, the Swiss was opposed to the brother of the Olympic Champion, Khusen KHALMURZAEV (RUS). With his little leg attacks, KHALMURZAEV quickly took a mental advantage over GROSSKLAUS and the Russian was close to scoring with a sumi-gaeshi, but the Swiss could turn in the air to escape landing on his back. In the meanwhile the Swiss was penalised twice for passivity as he was totally incapable of imposing his grip. Khasan KHALMURZAEV was also penalised with one shido, but when the last round of penalties were distributed, it meant two shidos for the Russian and three for the Swiss. Khasan KHALMURZAEV could point to his brother sitting in the stand to tell him 'you see, you couldn't win yesterday, but I did it today'. The first bronze medal contest opposed Joachim BOTTIEAU (BEL), who so far had 4 Grand Prix medals and Islam BOZBAYEV (KAZ), holder of three Grand Slam and three Grand Prix medals until today. The fist penalties for blocking the opponent were awarded after more than two minutes to both athletes even though they had been pretty active throughout the match. The second penalty came after more than two minutes and a half of golden score as BOZBAYEV received a shido for escaping. But after 3 minutes and fourteen seconds of extra time, the Belgium was also penalised for a false attack. As nothing was scored, it was the last penalty that was awarded to BOZBAYEV that decided the final result, offering a fifth medal in a Grand Prix to Joachim BOTTIEAU, after more than four minutes of golden score. In the second bronze medal contest, Quedjau NHABALI (UKR), bronze medallist at the Baku Grand Slam last year, faced the current world champion Nemanja MAJDOV (SRB). Exactly half way to the end, the world champion received a first penalty for false attack as he clearly was lacking precision and speed in his attempts to throw NHABALI. Less than thirty seconds later, the Serbian was penalised again for passivity. After thirty seconds of golden score, NHABALI was penalised a second time for a false attack, but the next shido went to Nemanja MAJDOV, who got disqualified. This is a tough way back to the reality for the world champion who is definitely not back to his best since his title in Budapest last year. 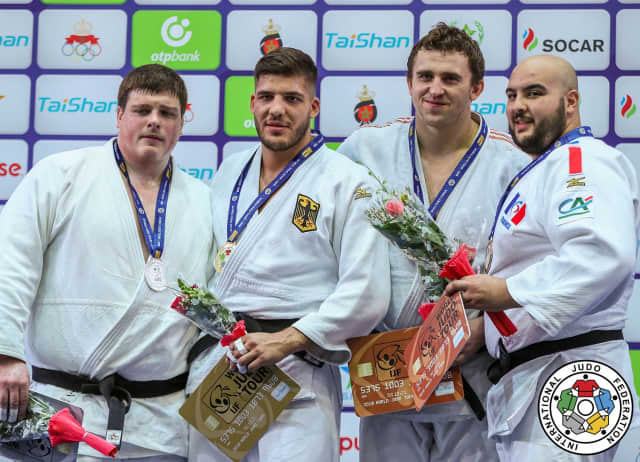 -100kg: DENISOV Imposes his Style With no surprise, the two best competitors of the day, five time world medallist Kirill DENISOV (RUS) and Jorge FONSECA (POR), who finished with a honourable third place in Düsseldorf a couple of weeks ago, were qualified for the final. The first waza-ari came from DENISOV who executed a 'little dance' in front of his opponent, to launch a first beautiful movement, but the second attempt was even more beautiful as the Russian countered FONSECA with an amazing O-soto-gari-gaeshi, the Portuguese landing flat on his back. The first bronze medal contest opposed 23-years-old Batyr HOJAMUHAMMEDOV (TKM) and Patrik MOSER (SUI), whose best result so far was a silver medal at the African Open Port-Louis 2015. As HOJAMUHAMMEDOV voluntarily took off the jacket of his belt, he was penalised with a first shido. Then it was the turn of MOSER to be penalised for a false attack. Just after the half of the match, HOJAMUHAMMEDOV scored a first waza-ari with well executed modified kata-guruma, but a few seconds later was countered by MOSER also with a waza-ari. 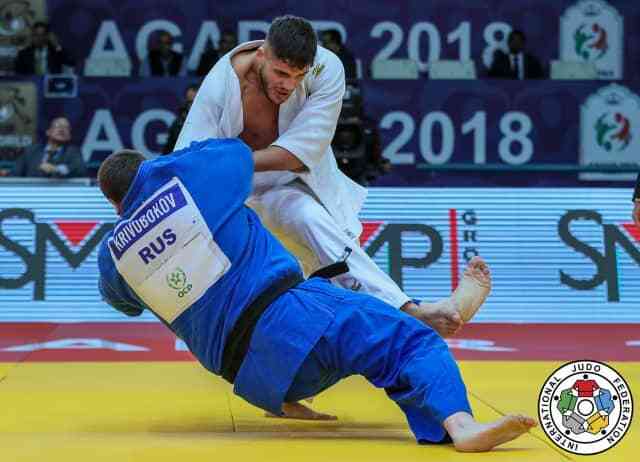 It must have been written in advance that this contest would not go until the end, as HOJAMUHAMMEDOV executed the perfect sase-tsuri-komi-goshi for a clear ippon and a first medal in a Grand Prix. The second bronze medal contest saw Tunis Grand Prix bronze medallist, Viktor DEMYANENKO (KAZ), facing the 2015 World silver medallist, Karl-Richard FREY (GER), whose brother was qualified in the final of the heavyweight. Both competitors were rapidly penalised as they were not trying to build positive judo. With one minute and thirty seconds left, the video refereeing was called to determine if DEMYANENKO's kata-guruma should be awarded with a waza-ari but the action was discontinuous and no score was given. 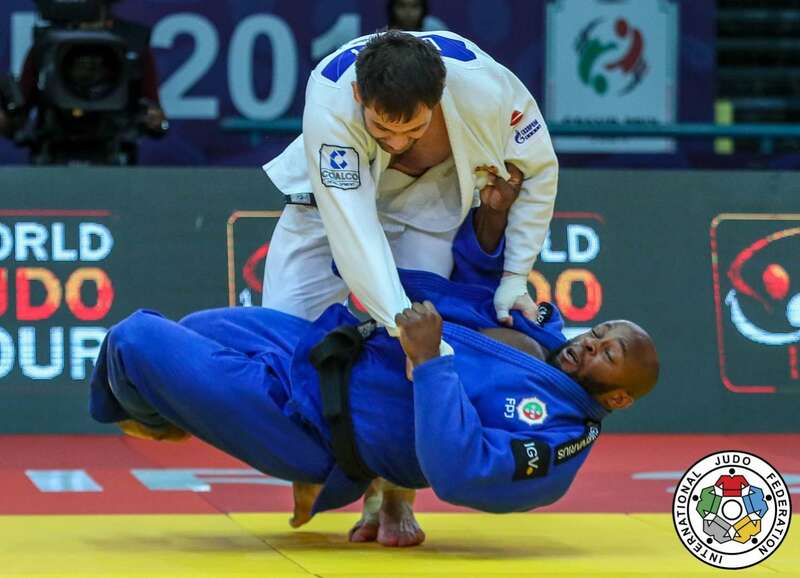 In the last twenty seconds DEMYANENKO was penalised one more time as he was refusing the contact and eighteen seconds into golden score received his third penalty, as Karl-Richard FREY left the tatami with the 11th Grand Prix medal of his career. +100kg: FREY to Conclude the Weekend The last final of the day and of the tournament opposed Johannes FREY (GER), who defeated the triple World Champion and London 2012 silver medallist, Alexander MIKHAYLIN (RUS) in the semifinal with a superb drop-seoi-nage, and the second Russian athlete of the category, Anton KRIVOBOKOV (RUS). Being much lighter than his opponent, Johannes FREY did not have many possibilities to throw KRIVOBOKOV, even though he tried really hard in different direction and was really close to do it with a swipe movement that he unfortunately couldn't control until the end. But at the end, his willingness to throw was awarder with the victory as the Russian was penalised a third time for passivity. 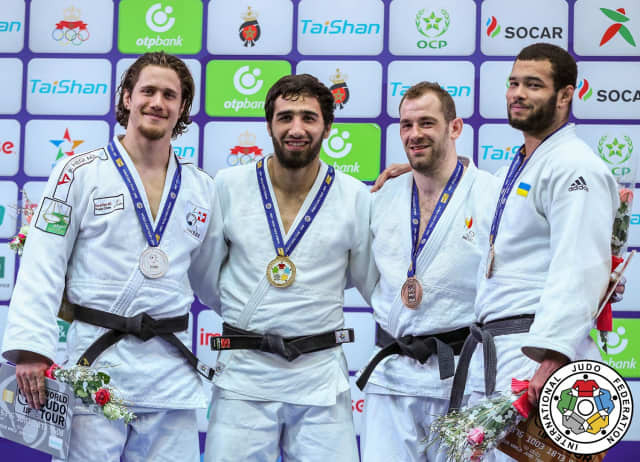 The first bronze medal contest opposed Hamza OUCHANI (FRA), who had no record on the international circuit, and the winner of the first Grand Prix of the season in Tunis, Oleksandr GORDIIENKO (UKR). Twenty seconds after the start, GORDIIENKO launched a massive harai-makikomi for ippon giving no chance to the French. For the second bronze medal contest, team France put its second athlete as Nabil ZALAGH was qualified against the giant Alexander MIKHAYLIN, 1,95m of muscle and titles. MIKHAYLIN was penalised a first time after having stepped out of the competition area. The second shido came for passivity a little later as the French received his first penalty. Carefully following the advice of his coaches, who were telling him to keep the same pace, Nabil ZALAGH continued to be more active to make the great champion penalised for the third time.